With the aim of fulfilling our corporate mission of “contributing to creating a society that is environmentally friendly and ways of living that are clean and comfortable through our work in the field of the Energy, Water, and Environment,” the MIURA Group has established a global sales and maintenance network that comprises boilers, water treatment equipment, food equipment, medical equipment, environmental equipment, and other products. In addition, the total solutions that we propose link peripheral equipment to the core boiler component in order to resolve issues that our customers confront throughout their factories. The July 2017 addition of Inax Corporation, an industry leader in the commercial washer business, is another illustration of how we have strengthened our capability to provide total solutions to our customers. Such affiliations enable us to better build upon our proven boiler technology to engineer and integrate equipment connected through water and steam lines to boilers so that our customers gain added value from a system that is greater than the sum of its individual equipment. We believe that we must never forget the customer’s perspective as we endeavor each and every day to maintain the trust that our customers have afforded us. As we maintain the equipment, we are right there with our customers where we listen directly to them and work together to solve any problems that they face. MIURA employees find gratification in delighting our customers and believe this also creates to a better society for us all. Our founder Tamotsu Miura left us with the mandate of providing “Technoservices.” “Techno” means the technology that is conducive to our customers, and “Service” means to gain the trust and affection of our customers as a human being. The coalescence of these two concepts to a high degree is what “Technoservices” are and what MIURA Group employees are committed to providing so that we may be of service to our customers all over the world in conserving energy and preserving the environment. We ask for your continued support in the future as well. 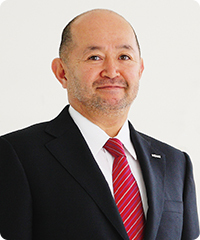 President & CEO MIURA CO.,LTD. Production, sale, and maintenance of small once-through boilers, marine boilers, exhaust gas boilers, water treatment equipment, food processing equipment, sterilizers, and chemicals, environmental certification, etc. COPYRIGHT © MIURA CO.,LTD. ALL RIGHTS RESERVED.